The Garmin Lifetime Updater program is a free application which is useful for those who own Garmin navigation devices. One of the main uses of this program is to get "lifetime" upgrades to your maps, but the lifetime designation is misleading because you're not actually given unlimited access to map updates. If you're one who purchased a Garmin license to upgrade for the device lifetime, you are actually allowed to update your maps up to 4 times per year, or quarterly. Do note that under the license agreement, Garmin may stop providing maps if its 'supplier' ceases to provide updates or if your device breaks. Version 2.1.11 is a freeware program which does not have restrictions and it's free so it doesn't cost anything. For security reasons, you should also check out the Garmin Lifetime Updater download at LO4D.com which includes virus and malware tests. Additional screenshots of this application download may be available, too. Garmin Lifetime Updater has a presence on social networks. 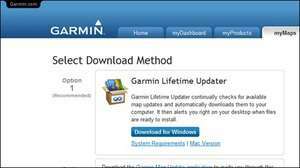 Garmin Lifetime Updater download been highly rated by our users.